Werndl M 1867 rifle. Superb bright full length fullered yatagan blade with crisp Austrian crest and GF on the ricasso and German makers logo C & J (=Clemen and Jung - Solingen) on the reverse side. Very good bright pommel and crossguard with muzzle ring and large quillon. MRD 18.3 mm. External spring and catch with large push button. Very crisp reg. marked: 81 and capital Z over 143. (= 81th Artillery Regiment Freiherr von Waldstatte, Iglau) on the quillon. Quillon is also marked O.P. Excellent checkered black leather grips fixed with four metal pins to the blade tang. Very good blackened and correct metal scabbard with no serieus dents. 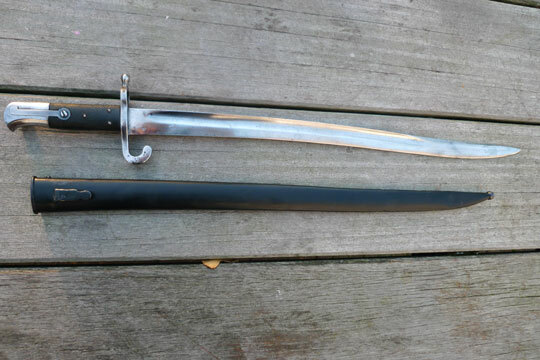 Extremely rare full length bayonet in an excellent condition! The Austrian M 1867 Werndl bayonet was official shortened in 1873. Full length models are very seldom encountered.